The UK needs an additional 366,000 primary school places* by 2020 and modular technology, along with true collaboration throughout the industry, can make this happen. 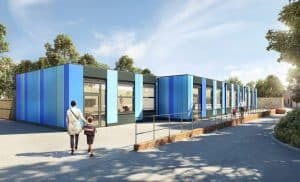 As an architect and designer who’s been involved in the education sector throughout my career, I’ve seen how offsite construction and modular technology has evolved to provide a permanent and suitable solution. We have, as a practice with a diverse nature, embraced the benefits of the volumetric offsite industry and have made it crucial to the success of the overall business. We also think it is vital to solving the pupil place crisis in the UK. 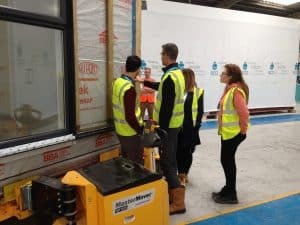 The modular industry has moved on dramatically over the past few years and, for education projects working to ESFA standards in particular, it has become the ‘go to’ approach for efficient building. For the last five years, we’ve worked with many offsite providers through a fully immersive process – merging construction efficiencies with clever design. Working closely with offsite providers is conducive to design and construction efficiencies. Through our development of pre-designed products, we’ve been able to work out the best adjacencies (how each space relates to another and how the building itself relates to the site), interrogate user flow diagrams and make clear and uncompromised decisions outside the strains of a live project environment. By designing in the background, solving all the problems and streamlining the process as much as we can, when a live project is won we’re already over half way to getting that project to completion. Offsite modular allows for standardisation but with component-led design, you have the flexibility you need too. Standardised modular design is not as rigid as people think – as long as the components are there, education facilities can be varied in design using a number of different combinations. Standardised modular design components deliver flexibility for education facilities. Why wouldn’t a client want confidence in buying into a process and a puzzle that has already been solved? It’s been my experience, and certainly that of our team, that modular design offers our clients peace of mind when it comes to the quality of a new school building. Modular can provide a design solution that meets the area brief, satisfies all regulations and is compliant with government standards. And above all else it’s conducive to a seamless experience for the client. 28 classrooms delivered in six months. Designed, planning approved, costed, built, occupied. As architects, we’ve challenged and embraced the use of modular construction. Our extensive research and development along with consistent delivery in this industry has resulted in our firm stance that offsite construction is the solution to commissioning and delivering projects quickly and on budget. But it will require all invested parties to get to know the modular industry, to get to know how beneficial it can be, if we are to get anywhere close to hitting government targets. 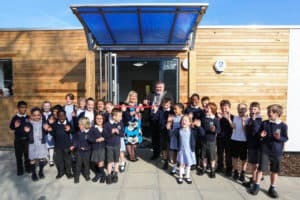 In the meantime, Lungfish will continue to advocate for offsite design and construction and help deliver the school places so desperately needed.